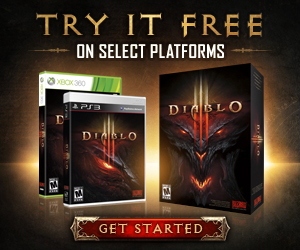 Diablo III patch 2.3.0 is now live in the Americas for PC! Check out the full patch notes below to learn all about the latest changes. Important: Please note that you will not be prompted to download patch 2.3.0 until the patch is live in your home region. If you are logging in from a European or Asian client, you will need to wait for this patch to release in that region before it can be installed. Additionally, if your home region is in the Americas, you will be unable to log into Europe or Asia using Global Play after patch 2.3.0 is live until those regions have also patched. Convert Set Item: Converts a Set item to a randomized piece of gear from the same Set. For example, if you convert a Blackthorne's Duncraig Cross, you could get Blackthorne's Jousting Mail, Blackthorne's Notched Belt, Blackthorne's Spurs, or Blackthorne's Surcoat in return. This feature will be available once Season 4 begins. To learn more about Season Journey, click here.